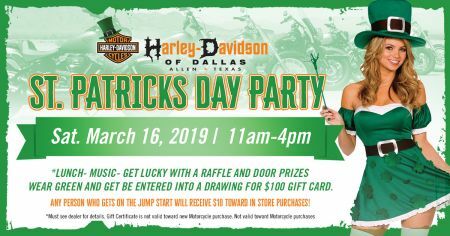 St. Patrick's Day Party at Harley-Davidson® of Dallas! Want to get lucky? Don't miss the St. Patrick's Day party at Harley-Davidson® of Dallas in Allen Texas! We'll serve lunch starting at 11:45. Get drinks and fun all day! We will have a raffle at 2 PM *must be present to win. Wear green to receive a ticket. The raffle prize is a $100 Gift Certificate! Plus, we'll also raffle off Licensed Harley-Davidson® Mugs along with a Licensed H-D® Horseshoe Kit. Come have fun and be ready to party! Some restrictions may apply. Must see dealer for details. *Gift Certificate is not valid toward new Motorcycle purchase. Any person who gets on the jumpstart gets 10$ off overall purchase.